Here’s the thing about life: sometimes it hands you free trips to Nantucket to celebrate your mother’s birthday…and sometimes it hands you buckets of vomit from your 2-year-old. What stinks is when those two things happen on the same day. We drove from Brooklyn to Cape Cod Thursday night, skipping Carlitos’ karate class, surviving downpours, chugging Coke to keep sleep at bay. Why the urgency, you ask? An 8:30 am ferry to Nantucket Friday morning for my mom’s birthday, that’s why. Just the six of us. A spectacular day on a boat and then on a fancy, schmancy island. A chance to wear our dusty reds and our navies. Eating seafood. Looking at whale skeletons. Celebrating the birth of our Mom/Jmum/Grammy. We were pumped, to say the least. So, when we were eating breakfast at 6:30 am on Friday and Xavi vomited all over the table, we brushed it off. I mean, we showered the poor little man and changed him and hugged him. But we decided he was probably just jumping around too much, or ate a bad grape or…hmmm, what else could it be….stomach bug? No. Certainly not. Nope. Still, we told ourselves he was fine. Just needed to get something out of his system. No big deal. An hour long boat ride? Why, I actually think that might help the situation. Calm his stomach. Sure. Third time. Third rinse off in the shower. Whimpering from Xavi. Husband finally bursts our delusional bubble. Sorry, but Xavi is not going to Nantucket today. My dad offered to stay with him so the three of us could still accompany my mom to the island. I was down with this plan, actually, until Xavi started calling my name. And then I held him on my lap, all cuddled up in a towel with his cherub face and pouty fish lips staring up at me. I started to waver. My mother sensed it immediately. We all debated whether I should stay or my dad. And then, with 3 minutes left before we had to leave in order to catch the ferry, Xavi made the decision for us: He did his biggest one yet. Chunks and sour liquid in my ear and my hair and all down my arm and back and face. It was magnificent, really. Done: I’m staying. Alrighty, I’m going to join Xavi for his fourth shower. You guys have fun wearing Kelly Green whale belts while looking for the Kennedys! Enjoy! Kindly, and against my strong urging, my husband stayed home too. It was only 8:15 am and already all plans had fallen apart. This is what you call Life With Children. But the truth is, it ended up working out kind of nicely. Carlitos got his Grammy and Papi to himself allllllll day. His excitement was palpable. And audible. By 9:24 am I had already received a text message from my mother asking where they might find Carlitos’ Off Switch. Sorry, he doesn’t have one. He is the only person I know who can talk more than I can. The good news is that, like the wagging tail on a puppy, Carlitos’ constant chatter means he is extremely happy. In all truth, I think the three of them had a wonderful and special day. They purchased hats for both boys, went to the Whaling Museum, had a seafood lunch (Carlitos may only be four, but heck if that child doesn’t have a ‘You must eat seafood when on an island’ rule. Love him. ), hired a little boat to drive them around the harbor while they waited for the ferry boat back to the Cape. Oh, and I think the Birthday Girl enjoyed herself as well. Back at Villa Vomit, things started looking up, too. For one thing, Xavi stopped puking up his guts. Always a plus. However, he obviously still wasn’t feeling great because he sat still all morning. That truly was a plus, albeit a pretty freaky site to see Xavi using a couch to lay on rather than as a launching pad. And then he and I took a FOUR HOUR nap together. Super plus…and pretty blissful. 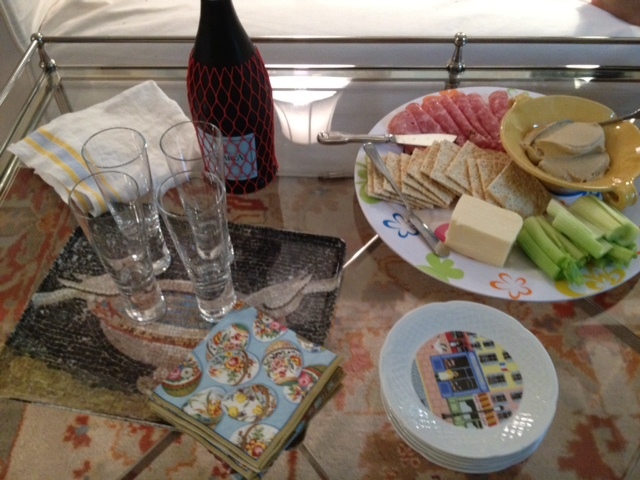 While we dreamed of JFK, Jr. setting up a picnic dinner with champagne for us on a private beach at sunset, my husband was out buying groceries for a birthday dinner. Okay, to be honest, I doubt Xavi was having the same Nantucket dream I was. Also, I can admit it’s a little creepy to be fantasizing about someone who isn’t alive but I wish you wouldn’t be so judgey about it. In any event, my husband picked up the elements needed to create my mom’s dream meal (or so we hoped): chicken, potatoes, asparagus, champagne. Now this is where I can admit that it ended up being a good thing that we couldn’t go to Nantucket. 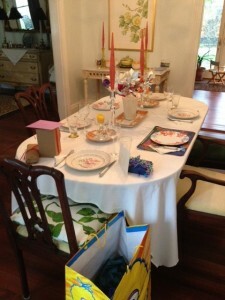 This way we were able to have a real birthday dinner awaiting my mom when they returned. My husband washed and roasted (on the outdoor grill) all ten pounds of potatoes. He then mashed them to perfection with whole milk and butter. 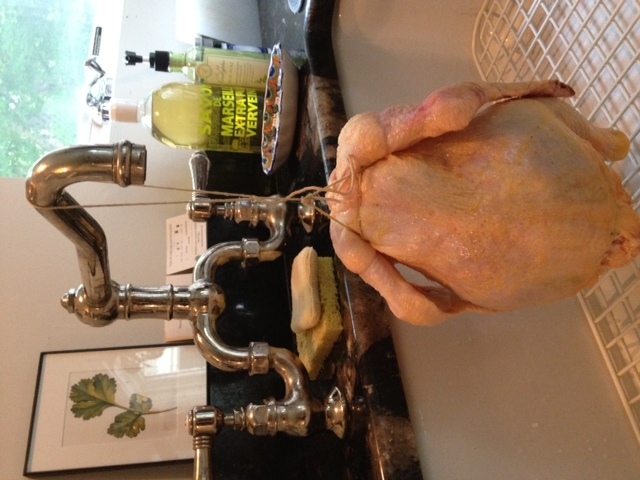 Next, he created a contraption to hang the chicken so that the skin would dry and then be perfectly crispy when we roasted it. 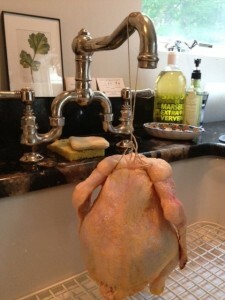 Remember when I explained my husband’s creative use of tools in the kitchen? Yeah, he finds a unique way to do just about anything food-related. However, spoiler alert: My mother, the Roasted Chicken Connoisseur if ever there was one, said it was the best roasted chicken she had ever tasted. Basically, his crazy methods seem to work. When Xavi and I awoke, he seemed cured of any nausea – or at least, that is what I took away from him running around in circles and jumping up and down like a Mexican Jumping Bean. With Xavi feeling better, I was able to set the table, cook the chicken and get the hor d’oeuvres ready. My mother always used garlic salt on the chicken skin to make it crispy but I couldn’t find any (the things you remember from your childhood as having Ultimate Importance that you then realize were perhaps more circumstantial happenstance) so we grated fresh garlic and mixed with salt and herbs. My husband doused the asparagus in lemon and handed me each squeezed half to stuff into the chicken cave. By the time they arrived home, everything was set. My husband claimed we should take the netting off of the champagne. I countered that we don’t usually buy champagne (okay, Prosecco) so fancy that it comes with a net, so I wanted to show it off for as long as possible. He was probably right, but I won. My mother is known for her impeccable table settings. 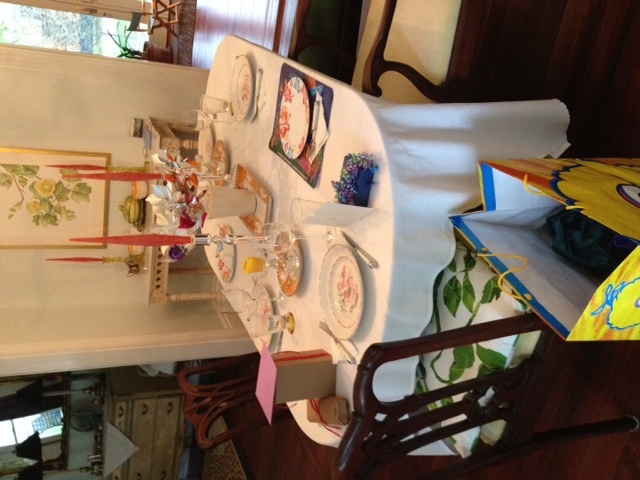 Among other creative skills I didn’t inherit from her, my table setting abilities are lacking. That classy business? Oh, that is an ice cream pizza. With a legit candle in the middle. The kind that actually belongs in a candlestick holder. Our elegance can’t be contained. So, I think we would all like to thank Xavi, because without his profuse upchucking, the evening simply wouldn’t have been so magical. And quite frankly, it wouldn’t have ended in a blazing ice cream pizza. Really, isn’t that how all birthdays should end? Xavi thinks so. Thanks, buddy. And Happy Birthday, Mom! This entry was posted in Real: my personal trials, tribulations and tales and tagged Birthday, grammy, ice cream pizza, mom, Nantucket, roasted chicken, Vomit. Bookmark the permalink. Follow any comments here with the RSS feed for this post. Post a comment or leave a trackback: Trackback URL. 6 Responses to Xavi says You’re Welcome. 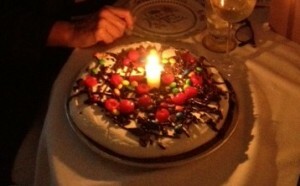 Oh, and Happy Birthday, Grammy. One of my very best birthdays ever. Thanks to my wonderful family! Vomit is the worse!! You guys totally turned lemons into something spectacular! I wasn’t sure how this was going to end since I had such a vivid picture of you covered in vomit. Sounds like a wonderful birthday! Mum – Happy to hear that!! We all love you! And next time I’ll get you REAL birthday candles! Sounds really lovely, especially the 4-hour nap. And there’s something of the JFK Jr. look in your husband, dontcha think? I mean, really–I know he’s anonymous for the sake of this blog, but shouldn’t your readers just imagine a JFK Jr. look-alike as the husband and father in this story? Happy Birthday to Annie’s mom, too! The four hour nap was pretty amazing. Trying to fully wake up AFTER the nap…not so amazing.